The most amazing view at Rosy Mound Natural Area is reached after you climb a long set of stairs to an observation deck called Dune Overlook. Below you are open and forested dunes, a small stand of white pines, a beautiful beach and Lake Michigan stretching to the horizon. You're on the edge of Grand Haven yet the only man-made object you can see is a boardwalk across the sand. Despite a history of logging, sand mining and uncontrolled recreational use, this park appears as natural and pristine as if you were standing in a remote corner of Sleeping Bear Dunes. Dedicated in 2004, the 164-acre natural area is one of Michigan's newest tract of protected dunes, a $1.1 million effort by Ottawa County to not only save the sensitive ecosystem but to shield and protect it from future visitors. Access into Rosy Mound is strictly on foot and all the trails are either boardwalks, cement or compacted, crushed stone. Lining the trails are signs asking you not to wander off them. Nor are dogs allowed in the park. The strategy is simple; concentrate park users on a hardened, erosion-resistant surface until they reach the beach. The nearly 200-foot dune that dominates the park is Rosy Mound. Allegedly the dune was named by either early settlers who found the top of it covered with wild roses or by Native Americans for the rosy hue cast on the dune at sunset. What is known is that the area was heavily logged in the late 1800s and again in the early 1900s, a time when Grand Haven alone boosted eight saw mills. By 1924 a company was mining the dune, shipping the sand to foundries throughout the Midwest. Interest in preserving the tract began in the 1960s when the students of nearby Rosy Mound Elementary School appealed to Senator Phillip Hart. By 1989 acquiring Rosy Mound was a priority of the Department of Natural Resources and a newly formed Ottawa County Parks and Recreation Commission. The state finally purchased the area in 1994 and in 2003 deeded it to the county. By then it had become an unregulated playground with a mishmash of trails causing serious erosion. The park's infrastructure required a year to build and involved helicopters ferrying in wood and buskets of cement to avoid damaging the dunes. Workers meanwhile were transplanting endangered Pitcher's thistle from the construction areas. When the park officially opened the only way for visitors to reach the beach was by hiking over Rosy Mound. 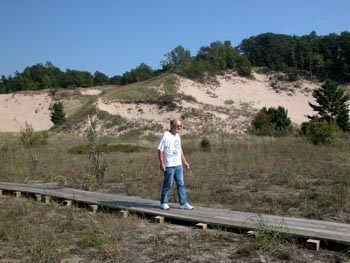 Rosy Mound has two miles of trails through a classic Great Lakes dune ecosystem. The walk from the parking lot to the Lake Michigan beach takes you through a backdune forest of mature beech, maple and hemlock as well as along the edge of huge blowout or parabolic dune. You end of up in an area of foredunes before reaching the park's half mile of wide, sandy beach, ideal for swimming. The main route to the beach is the Lake Michigan Trail, a 0.7-mile walk from the parking lot to a shade canopy and restrooms near the beach. This trail can be a bit of a workout at times as it includes climbing 360 steps over Rosy Mound. Along the way are a series of interpretive panels, numerous benches and two observation decks; Forest Overlook and Dune Overlook. 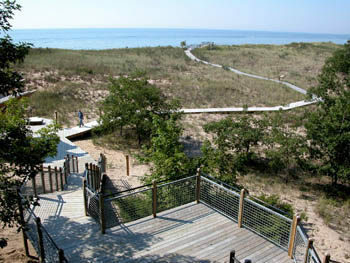 At the shade canopy you can quickly access the beach via the South Beach Access Trail or the North Beach Access Trail. Both are short boardwalk trails the end at observation platforms. From the decks stairways lead to a beautiful beach below. To extend the hike continue on the Dune Trail from the North Beach Access Trail at post No. 5. The Dune Trail leads to the White Pine Loop and together the two trails form more than a half mile of boardwalk into the foredunes of the park and past emerging pine forest. Along the White Pine Loop is a short spur to the Dune View overlook. 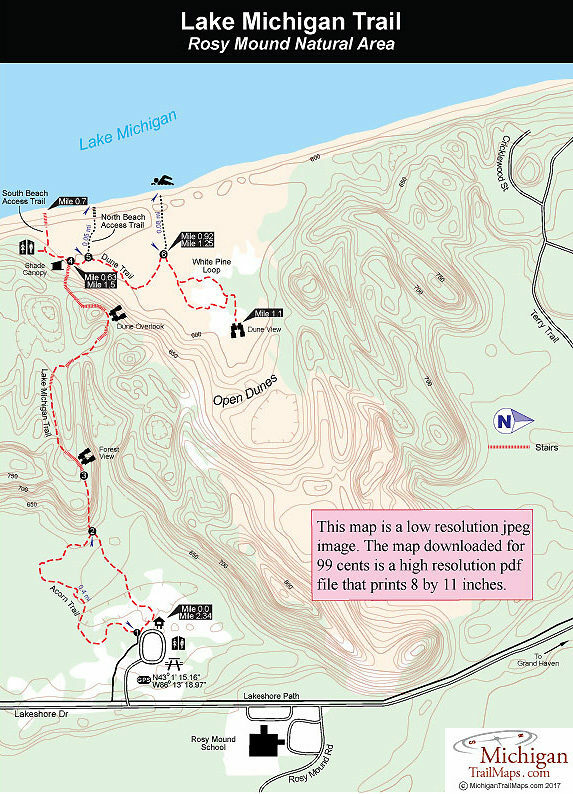 Also departing from the parking lot is the Acorn Trail, a 0.4-mile spur that winds through more open dunes and hardwood forest before merging with the Lake Michigan Trail at the base of Rosy Mound. All these trails can be combined for a round-trip hike of 2.5 miles. The park also has a paved path that connects to the Lakeshore Avenue Bike Path, the 20-mile trail that links Holland State Park with Grand Haven State Park. Bicycles are not allowed on any other trail in the park. Rosy Mound has a small picnic area with grills and restrooms near the entrance and additional restrooms near the beach. Near the start of the South Beach Access Trail is a unique shade canopy while interpretive signs are found along most of the trails. Rosy Mound is open year round. 7 a.m. to 10 p.m. from April through October and 7 a.m. to 8 p.m. from November through March 31. Motor vehicle parking fees are in effect from Memorial Day weekend through Labor Day weekend. Rosy Mound is located south of Grand Haven in Grand Haven Township on Lakeshore Avenue. From US 31, turn west on Rosy Mound Drive, then south on Lakeshore Avenue to the park entrance on the west side of the road.